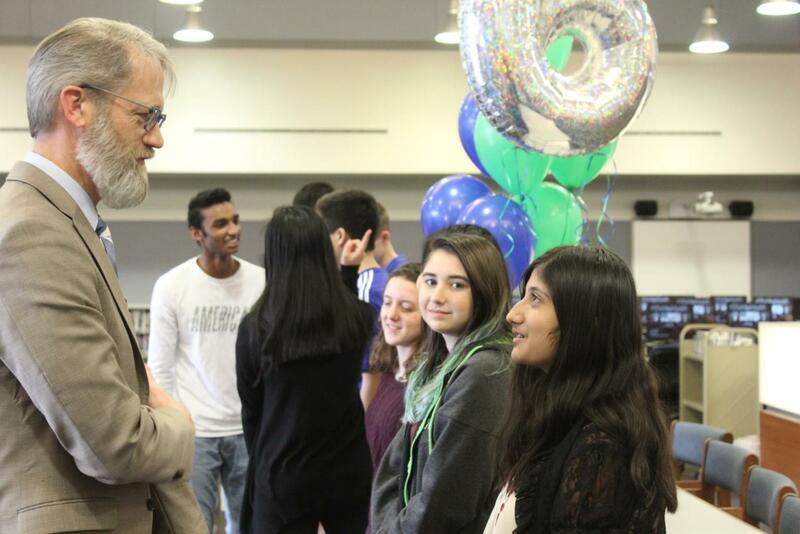 Sriya Kosaraju, sophomore, talks with Superintendent Dr. Eric Knost as he congratulates her on her perfect ACT score. Kosaraju was one of nine students who received a perfect score of 36 on her ACT. When Sriya Kosaraju, sophomore, was called to the principal’s office, she had no idea about the news she was about to receive. She is one of nine students at MHS who earned a 36 on her ACT – and could not be more thrilled. The other students were seniors William An, Michelle Li and juniors Jacob Besch, Eric Chien, Brooke Davis, Rachel Pang, Sydney Ring and Michael Wu. “When I took the test, I knew I did really good but I didn’t expect a perfect score,” Kosaraju said. 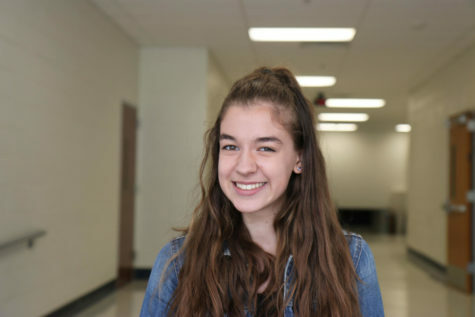 Kosaraju said she decided to take the test as a sophomore because she was familiar with all the curriculum and wanted to get it out of the way while it was still fresh in her brain. However, she was prepared to take it again if she earned a low score. In a span of two months, Kosaraju took multiple practice tests and read books about the test to prepare, mainly studying on the weekends, a few hours at a time, she said. Now that she doesn’t have to worry about the ACT anymore, Kosaraju wants to focus more on her academics and extracurriculars. Although she doesn’t know what she wants to do after high school yet, Kosaraju said her score it will definitely help with college admission. 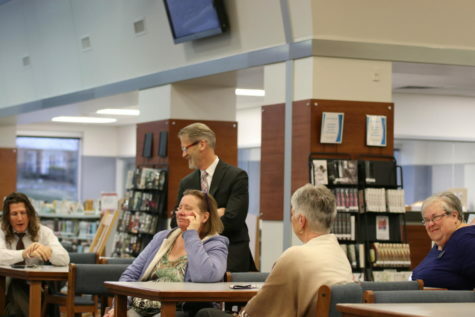 “I’m trying to keep my options open and try to experience everything before I make a total decision,” Kosaraju said. Sirisha Kosaraju, Sriya’s mother, said she was extremely happy and proud when she heard news of Sriya’s score on the ACT, and that Sriya’s hard work had paid off. “She did a lot of practice tests, and practiced for two months before the test so she practiced good,” Sirisha said. Sirisha said Sriya was scoring very well on her practice tests and typically scored a 35 or 36, so they were hoping for a 36 on the real test. Now that the test is over, Sirisha said she hopes Sriya will focus more attention on figuring out what career she wants to pursue in the future and work towards it in high school. Principal Dr. Greg Mathison said it is a major achievement for any student to score so high on the ACT, which shows to universities a strong academic background and readiness in academics. “It’s an accomplishment for anyone, but for a sophomore that took it first semester with only a year and a half of high school to get a 36 is just mind-blowing,” Dr. Mathison said. Mathison said that Kosaraju, as well as the eight other students who scored a 36 on the ACT, not only put in major effort themselves, but also received support from their families for education and that plays a major role in success on standardized testing, in addition to encouragement from the school and the faculty. Mathison said one of his goals is to celebrate each individual achievement and the effort students have put in academics. He wants to make sure students are recognized for their accomplishments in placing in the 99.9 percentile of the entire country. Kailin Zhang, junior, is the Associate Editor for the Messenger. She is the co-president of FBLA and runs track. She enjoys shopping and traveling. Kudos to all specially Sriya! It’s like scoring a perfect ten in gymnastics! !